A birth certificate copies is usually issued at the time of registration. The birth must be registered with the Registrar of Birth and Deaths within 42 days (6 weeks) if born in England and Wales. If the birth was in Scotland, the registration must take place with 21 days. For nationality purposes, the only acceptable certificate is a full British (UK) birth certificate. This certificate shows the father's profession along with the parents general details. As documentary evidence, if the birth certificate was original, meaning issued within 12 months of the date of birth, it will usually be classed as Group 1. 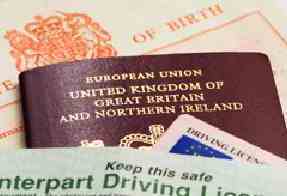 Other Group 1 documents are a valid passport and UK Driving licence. If the certificate is non original, meaning issued 12 months after the date of birth, it will usually be classified as Group 2. Other Group 2 documents are a marriage certificate and bank statement. Most UK birth certificates do not have the time of birth recorded, and so are not suitable for solely astrological research. It is very important for anyone adopted who is wishing to trace their birth parents prior to their adoption, and UK law allows adopted people to obtain their certificate once they reach the age of 18. All certificates should be issued with a stamp or seal, indicating their official nature. They will also be issued on high grade paper, which will contain a watermark which will be visible when the certificate is held up to light.